This is a sponsored post written by me on behalf of Canvas Factory. I was given a canvas to facilitate my review. All opinions are my own. Bring travel photos out of your hard drive and into your life! It’s amazing to live in a time when we have cameras with us at all times. Growing up you had to think about what you wanted to take pictures of, have a camera and film with you and then actually print out the photos, which might not even turn out right. 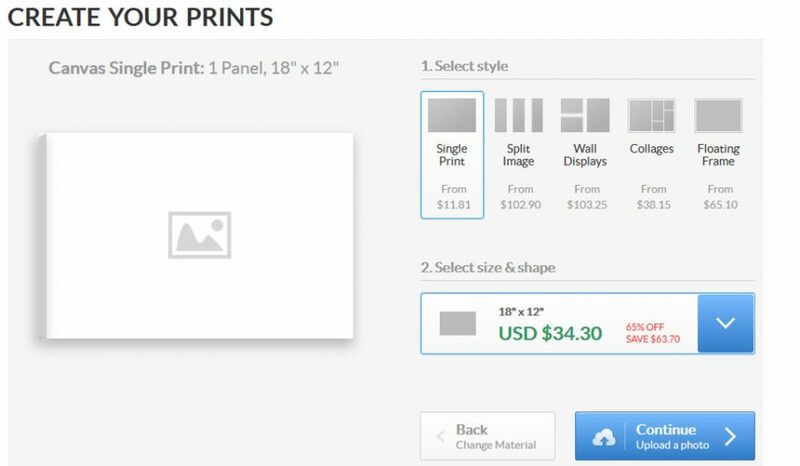 The only way to share your photos was to actually show the physical prints to someone. While its easier than ever to share photos now, I think we lose some of the pleasure of photos as a way to preserve memories when they only exist on our phones and hard drives. I’m a big fan of bringing those photos back into the analog realm as a physical reminder of memories we have shared as a family. There are lots of easy ways to bring your family vacation memories into you daily life with photos. Print out your photos. Whether you use an online service, a local printer or even your at-home printer, choose some of the best photos from each trip to print out. Add them to a photo album or frame a few to put on display. Make photo books. There are tons of online services that make it easy to make little custom books for each trip. This is a great way to capture memories in words and pictures and might help you remember details you wouldn’t with the pictures alone. You could even ask kids for a few of their favorite memories of a trip to include in the book, or let older kids make their own books. Buy prints of vacation locales. Back in the days before phone photography, my husband and I bought a print of a place we visited on our honeymoon. It hangs in our kitchen dining area and I love having that reminder of the time and place. Buying photos is great because it helps support local artists and you can get that perfect shot without having to do the work yourself. Print it big. As digital and phone cameras get better and better, you can actually have those photos printed in large format on paper, canvas, acrylic or metal. I was given the opportunity to try the printed canvas from Canvas Factory, and I wad really impressed with the quality and speed of the process. Ordering online is simple. You can choose among the different materials to print on — canvas, acrylic or metal — and the size or format of the prints. They offer a single print, collages, split images, wall displays and printed canvas in a floating frame. The single canvases range in size from 8 x 8 square to 36 x 12 panoramic. I was given a 16 x 20 print. Choose your size, upload your photo, crop and adjust. 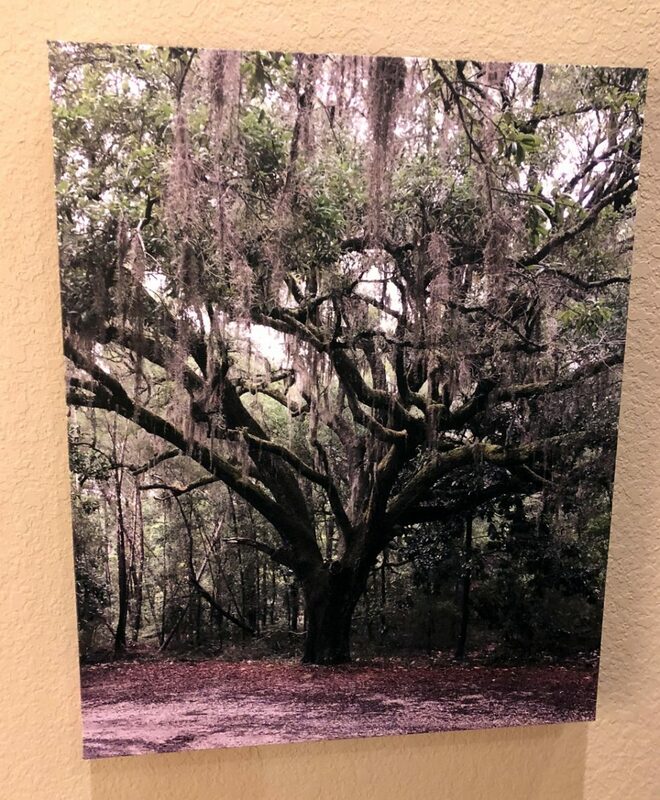 I went with a photo of a giant live oak I took on vacation last summer. I think I took it with my cell phone, and the original had cars in it, but I was able to crop it so the tree stands alone. The print actually shipped faster than estimated and it looks great. 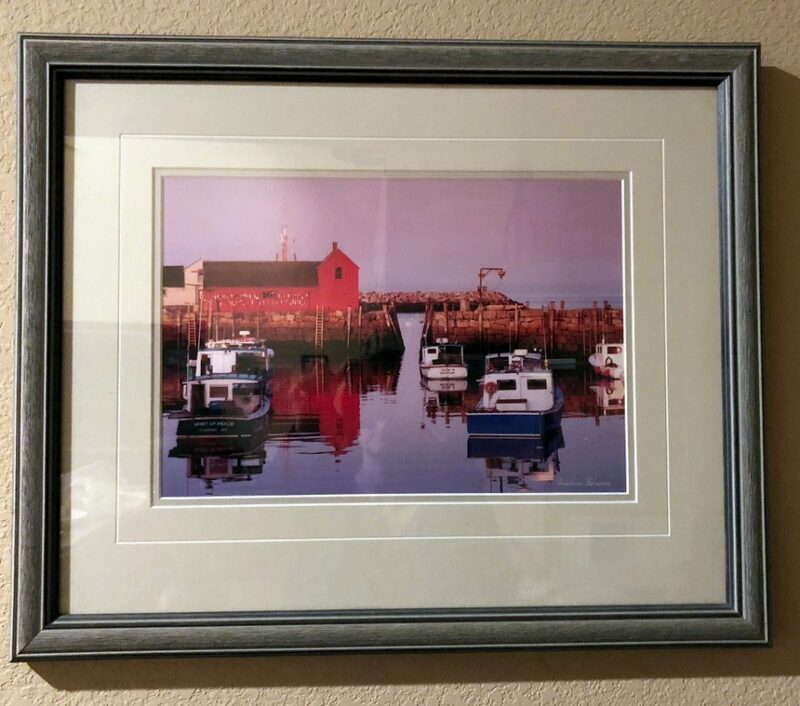 The canvas is printed over the sides so you don’t have to frame it, and strong mounts on the back make it easy to hang the print horizontally or vertically. 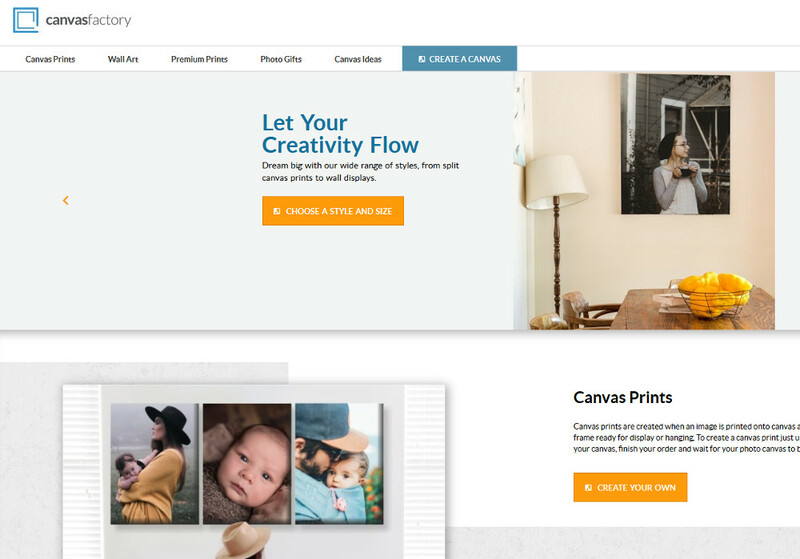 If you’d like to try Canvas Factory for yourself, they are offering one of my readers a free 16 x 20 print. One winner will be chosen at random. Contest is open through April 13. What do you do with your vacation photos? I’d love to hear about it! Thanks again to Canvas Factory for Sponsoring this post! I LOVE decorating with canvases–so easy and convenient! And remembering special vacation memories this way is the best! Thanks for the opportunity to win one! Meredith Spidel recently posted..Raspberry Lime Coconut Crusher: Vacation in a Glass! I need to be better about printing out the shots I really love. I’ve decided to stay digital and not print out anything, usually. I do have some decorating the craft room, though. We try to do at least a scrapbook page for each vacation. We also make an ornament for the Christmas tree. We use those empty glass ornaments and fill with mementos of the trip. I really need to get better about printing out photos. I try to at least do a book of vacation photos, but I’d like to have more prints around the house too! I like to make photo books of my favorite vacation pictures. I have a few vacation photos on my desk. I keep them up at work to remind me of good times when I’m having a bad day. I have my vacation photos set to rotate on my computer desktop. It makes me happy to remember what fun we all had! I have photos all over my house. I like pictures to look at when I walk through a room not browse thru my phone. I like to hang some up in the house and add some to our scrapbooks. 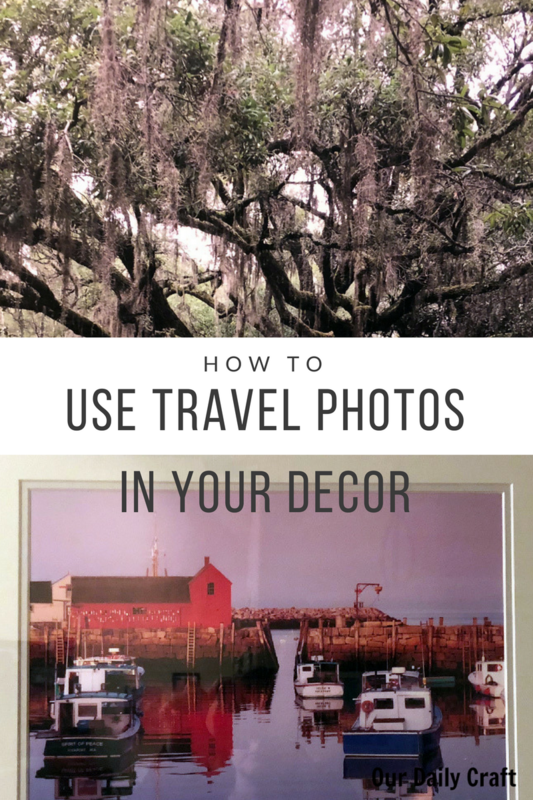 I display my most favorite vacation photos on my walls and shelves so I can have them decorate our home. I actually post vacation photos and I also make posters out of it to display on my wall in frames. i have vacation photos sitting around. I have photos hanging all over my house.